Your wedding day is one you’ll treasure for the rest of your life. 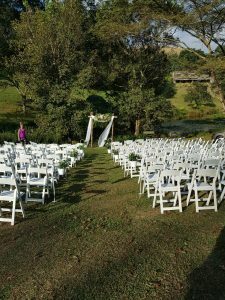 You want it to be a magical event, and for you and your guests to take away glorious memories of this day. We make your dream a reality! 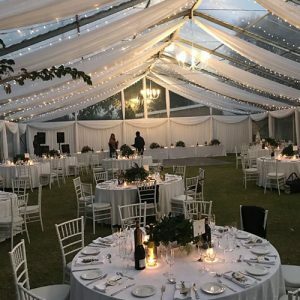 No matter where you’ve chosen the event to take place, be it on the KwaZulu-Natal north coast in a wild bush setting, or a beach wedding on the south coast, Weddings & Functions can supply you with an elegant white marquee of your choice, complete with chairs and tables covered in quality linen and decked in fine crockery, cutlery and glassware. We also supply all necessary draping and lighting to create an enchanting wonderland inside your marquee. We can supply all the necessary catering equipment. If you require a dancefloor to be set up, we can be of service. Even if you have a theme or specific colour-scheme, we have a large stock and will supply the required linens and drapings. We have our own Linen division, and will make-up the necessary linens if need be. We will work with your function co-ordinator to ensure the smooth set-up, and see that every detail is taken care of.